Boy band EXO released their first studio album "XOXO (Kiss & Hug)" on June 3 and the title song "Wolf" zoomed to the No. 1 spot on real-time charts in Korea. Upon its release, "Wolf" topped the charts on Olleh Music, Naver Music, Soribada and Bugs. "XOXO" contains 11 other tracks including "Black Pearl," "Peter Pan," "Baby Don't Cry" and "My Lady." The album was released in Korean version called "Kiss" and Chinese version called "Hug." EXO is composed of 12 members and has two subunits: EXO-K for the Korean market and EXO-M for the Chinese market. "XOXO" was also released worldwide on iTunes where it ranked in the Top 10 in different countries. In the Philippines, "XOXO" ranked third on iTunes Top Albums chart. On iTunes Top 10 Pop Albums chart, "XOXO" ranked No. 6 in the US, No. 9 in Canada, No. 7 in Denmark, No. 8 in Finland and No. 2 in Japan. It also ranked third in Japan and 10th in Finland on iTunes Top 10 Albums chart. "XOXO" placed at No. 49 on iTunes Top 100 Albums chart. The boys of EXO have started promoting "Wolf" on TV music shows last May 30 with a comeback performance on Mnet's "M Countdown." EXO also appeared as guests on the KBS radio program "Kiss the Radio" hosted by Super Junior's Ryeowook. The overwhelming response of fans crashed the servers of the radio program's website. 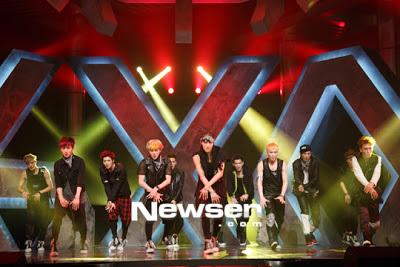 Last June 2, EXO met about 2,000 fans after they performed on SBS "Inkigayo." The music video for "Wolf" was released last May 30 on YouTube and has garnered 3 million views to date. EXO flew to China on June 3 to tape their performance on the popular variety program "Happy Camp." The boy band debuted in the K-pop scene last year under SM Entertainment. EXO visited the Philippines last January and performed at the Dream K-pop Fantasy Concert together with Girls' Generation, Infinite, U-Kiss, Tahiti and Tasty.